Many people have an aversion to fish for no other reason than they haven't really tried it or just remember not liking it from their childhood. If you fall into this category then you're missing out on one of the most versatile, quick and easy meals around. Pick the right variety and it's also very economical - great for those student food budgets. Fish is low in fat and it's a good source of protein, especially if you don't eat red meat. Oily fish such as salmon and mackerel are also packed with essential omega oils, which are the latest buzz words on the nutrition circuit, as they can help boost your brain power. So, what further excuse do you need? Perhaps one of the reasons that people shy away from the fish counter when they go to the supermarket is that they don't necessarily know what they're looking for, or they haven't got a clue about how to cook the piece of fish once they get it home. It's true that fishmongers, or fish counters in supermarkets, can appear a little daunting at first glance. However, you don't have to fill in a questionnaire or do a blind taste test before you're allowed to buy anything; staff are trained and will be only too pleased to offer advice. If you're not sure what to choose, ask what's good that day, or just pick something that looks appealing - chances are it will taste great! The price of different fish can vary enormously, so always check out the price per kilo before you buy. Buying the same variety of fish on a different day can also have a very different effect on your wallet. This is because fish catches vary a lot and weather conditions and availability can play havoc with stocks, so fishermen, and subsequently fish buyers, don't know what they're going to buy until the boats are in. Trends in fish also affect the price - for example, monkfish has seen a huge increase in popularity in recent years, and the price reflects this. If you don't eat much fish, you might want to choose a simple white variety to begin with, such as haddock or cod, as the taste is fairly subtle. Fish can be cooked in many different ways. Of course, certain varieties are better suited to particular cooking techniques but let's assume you've just bought a piece of haddock. Below are a number of different ways you could cook it. You can tell if it's cooked as it will have lost the translucent appearance and the flesh should break easily into lovely flakes. This is a simple technique that ensures the fish remains moist. Choose a pan that's a little bigger than the amount of fish you're cooking. Lay the fish fillets in the pan then just cover with milk. Add a few whole black peppercorns and a bay leaf, if you've got one. Bring to a simmer and cook for about 8-10 minutes, or until the fish is cooked through. Remove with a slotted spoon. Great served with mash and peas. Lay some foil over the grill tray, place the fish on top and drizzle with a little oil and lemon juice. The cooking time will depend on the size of the fillets but keep checking the fish and turn halfway, if you like. You could also add a touch of glamour to your fish by spreading a teaspoon of green pesto on the top and scattering over some grated Parmesan a couple of minutes before the end of the cooking time. Refer to the instruction booklet for the precise timings for your make of steamer. Pop some new potatoes into one tray, fish fillets in another, and some fine French beans in a third and cook according to the instructions (adding the ingredients in the correct order so they're all ready at the same time!). Serve with a quick sauce made from melted butter, a dash of white wine and a touch of mustard. Baking is a good option if you want to include some other flavours with the fish. Take a piece of foil large enough to wrap loosely around the amount of fish you're cooking. Place some thin slices of lemon on the foil. You could also add lemon grass and red chilli, if you like. Place the fish on top and drizzle over a little oil. Wrap the foil up and around the fish, leaving a small opening in the top, to allow steam to escape. Bake in a preheated oven at 200C/400F/Gas Mark 6 for about 18-20 minutes, depending on the size and thickness of the fish. 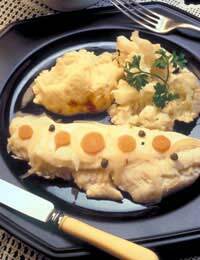 Your advice on poaching (and other ways of cooking) haddock seems very sensible and in touch with real life. This ( I know comparisons are odious but...) is unlike the other nine sites I have looked at on the google page I have been searching. Please carry on your good workand accept my blessing. I will try to poach some haddock. I am not a student except of human nature ,of course, but I was one in 1960-63 when landladies and mothers cooked all the fish . And they did it very satisfactorily.